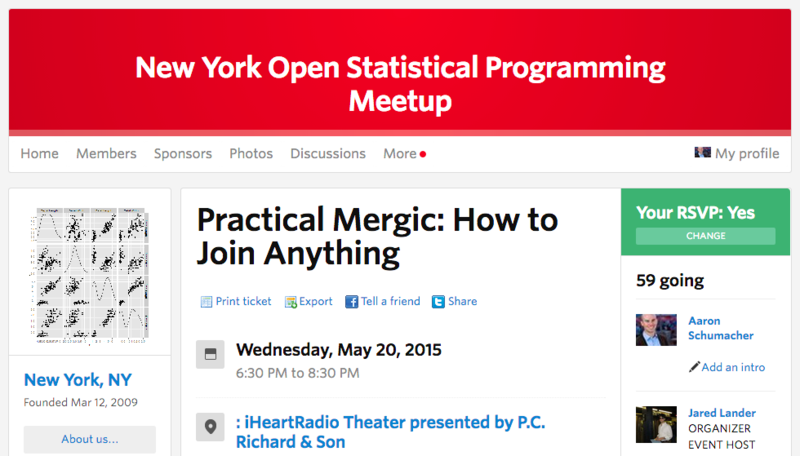 A lightning talk at the May meeting (registration) of the PyData NYC meetup group, introducing mergic. The problem often looks like this: You have either two columns with slightly different versions of identifiers, or one long list of things that you need to resolve to common names. These problems are fundamentally the same. This is what mergic is for. 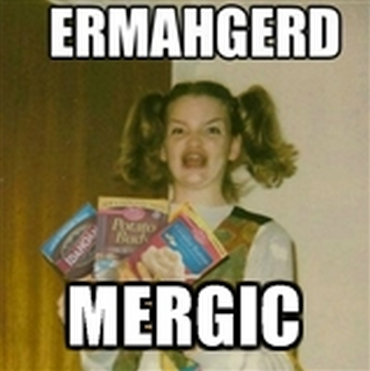 mergic is a simple tool designed to make it less painful when you need to merge things that don't yet merge. This is John Langford's slide, about what big data is. He says that small data is data for which O(n2) algorithms are feasible. Currently mergic is strictly for this kind of "artisanal" data, where we want to ensure that our matching is correct but want to reduce the amount of human work to ensure that. And we are about to get very O(n2). So we make all possible pairs of identifiers! This is annoying for a computer, and awful for humans. The computer can calculate a lot of pairwise distances, but I don't want to look at all the pairs. Do these records refer to the same thing? The is a "screen shot" of the csvdedupe interface, which is based on the Python dedupe project, which is very cool. It could be exactly what you want for larger amounts of more complex data. There's even work on getting learnable edit distances implemented now, which would be great to see. But for very simple data sets, dedupe can be overkill. Also, you don't get much sense of the big picture of your data set, and it's still very pair-oriented. Aside from being a drag to look at, there's a bigger problem with verifying equality on a pairwise basis. Karolina has a twin sister, and Kristyna also plays professional tennis! This may well not be obvious if you only look at pairs individually. What matters is the set of names that are transitively judged as equal. Both perceptually and logically, it's better to think in sets than in a bunch of individual pairs. Open Refine is quite good. Their interface shows you some useful diagnostics, and you can see sets of things. There's even some idea of repeatable transformations. But there's so much functionality wrapped up in a mostly graphical interface that it's hard to make it part of an easily repeatable workflow. And while there are a bunch of built-in distance functions, I'm not sure whether it's possible to use a custom distance function in Open Refine. Here's a quick run-through of the mergic workflow. It's similar to the one in the README. I'll start by making a new virtual environment using pew. mergic is very new (version 0.0.4) and it currently installs with no extra dependencies. mergic includes a command-line script based on argparse that uses a default string distance function. The command line script has a number of sub-commands that expose its functionality. We'll try mergic out with an example data set from R's RecordLinkage package. The data is fabricated name and birth date from a hypothetical German hospital. It has a number of columns, but for mergic we'll just treat the rows of CSV as single strings. The calc subcommand calculates all the pairwise distances and provides diagnostics about possible groupings that could be produced. With a cutoff lower than any actual encountered string distance, every item stays separate, the maximum group size is one, and there are no pairs within those groups to evaluate. On the other extreme, we could group every item together in a giant mega-group. mergic gives you a choice about how big the groups it will produce will be. In this case, there's a cutoff of about 0.12 that will produce 50 groups of two items, which looks promising. We can make a grouping with that cutoff, and the result is a JSON-formatted partition. The above would be a strange change to make, but you could make such a change and save your changed version as a new file. mergic includes functionality for creating and applying diffs that compare two partitions. You can preserve just the changes that you make by hand, which provides a record of the changes that had a human in the loop versus the changes that were computer-generated. To actually accomplish the desired merge or deduplication after creating a good grouping in JSON, mergic will generate a two-column merge table in CSV that can be used with most any data system. These merge tables are awful to work with by hand, which is why mergic leaves their generation as a final step after humans work with the more understandable JSON groupings. It's easy to write a script with a custom distance function and immediately use it with all the workflow support of the mergic script. 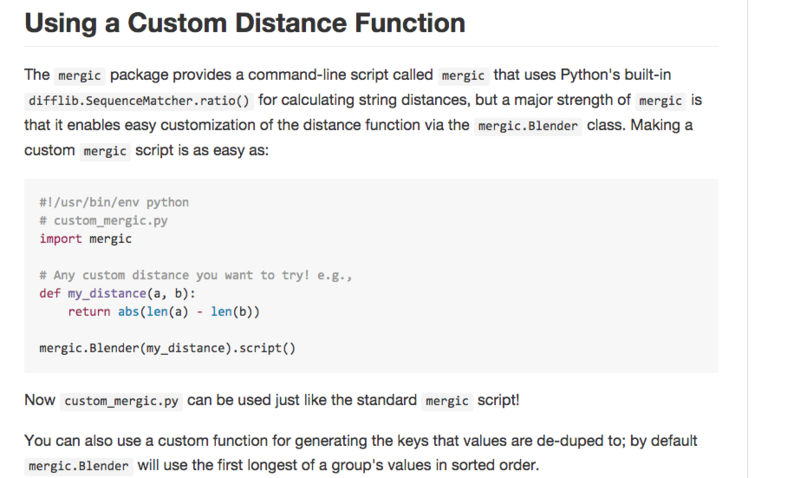 Often, a custom distance function makes or breaks your effort. It's worth thinking about and experimenting with, and mergic makes it easy! If you're interested in this kind of thing, I'll be doing a longer talk at the New York City Open Statistical Programming Meetup next week Wednesday. 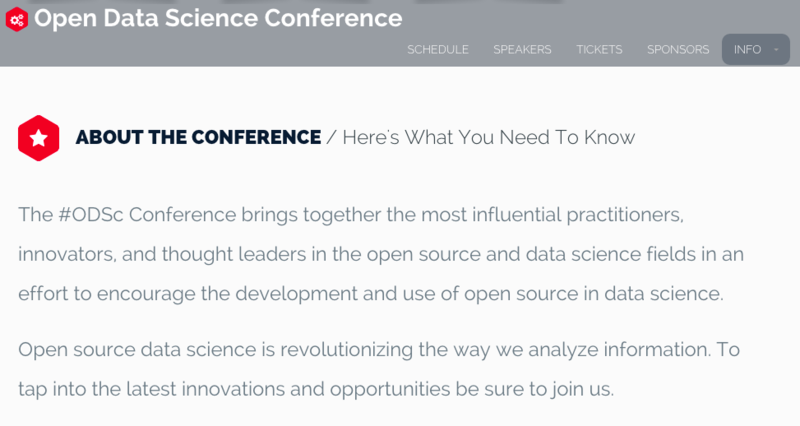 I also hope to see you at Open Data Science Con in Boston!